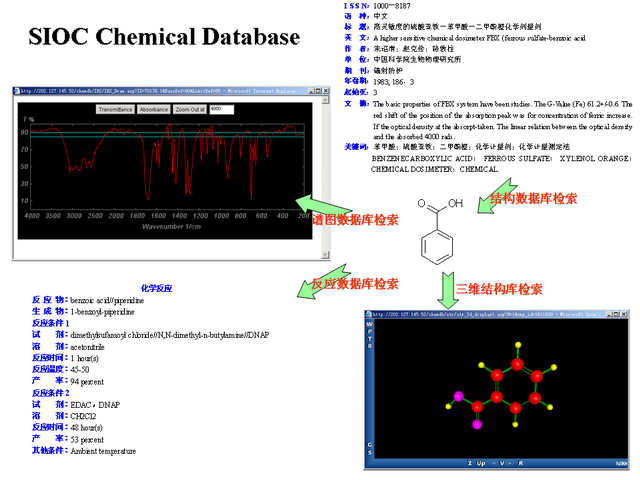 The chemical database developed by Shanghai Institute of Organic Chemistry (SIOC) was an important part of the Scientific Database, a major special one concerning information construction of knowledge Innovation Projects of Chinese Academy of Sciences. SIOC chemical database is the general informational system for chemical and chemical engineering research and development. It consists of more than 20 different chemical databases, such as compound structure database, Chinese traditional medicine and chemical component database, chemical formula database, toxicity compound database, chemical product database, Chinese chemical literature database, English chemical core literature database, chemical technical information database, fine chemical product database, biologically active compound database, engineering plastic database, etc. The total physical size of the chemical database has exceeds 300GB, and about eight million records has been contained, and all the data have been shared and serviced on internet. Now the database supplies chemical information including compound nomenclature, structure diagram, basic property, toxicity, spectrum, identification method, chemical reaction, medical and agricultural drug application, natural products, relative references, market support and so on. It also provides services of compound name translation and structure processing technique sharing.